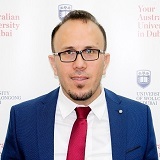 Dr Kamal Jaafar is an Associate Professor in Engineering Management with the Faculty of Engineering and Information Sciences. He holds a B.S, MPhil and PhD Degree in Civil Engineering from the University of Cambridge, and an MBA degree from Ashcroft International Business School in Cambridge. He also attained studies in international relations from Harvard University. In 2004, he was honoured by Prince Charles as a Fellow of the Cambridge Overseas Trust. In 2005 his research won first prize at the Royal College of Physicists in London organised by KRSF. Recently he has been honoured by the Lebanese government for his academic achievements. His research interests focuses on seismic design and safety implementations for concrete structures. His research has been published in well known engineering journals such as the ACI Journal, Canadian Journal for Civil Engineers, and Magazine of Concrete Research. He has presented his research at various international conferences in UK, USA, Greece and Italy. Dr. Jaafar is a corporate consultant and a trainer in Project Management.